Looking for academic & scholarly books? Biblio.co.nz hosts hundreds of of the finest online book stores and booksellers, including specialists in academic & scholarly. Use the list below to locate a specific specialist bookseller or book store near you. Or, use the form below to search the inventory of all booksellers who specialize in academic & scholarly. Selling online for over a decade. General stock, concentrating on non-fiction, academic in all field of study. We are a member of the PBFA and ibooknet -www.ibooknet.co.uk Our specialisms are academic books particularly literary criticism, literary biography, literary texts and literary and critical theory, history, plus some philosophy, psychology, politics and religion. We also stock local history books, mainly on Yorkshire. We also stock children's literature. We have a small general stock in the wider academic arts and humanities. We have been trading since 1985 by shop and by mail, and on the internet since 1997. Studio Bookshop was established in Brighton in 1995. As well as specialising in Art & Exhibition Catalogues, Academic & Scholarly Books, we are the leading European bookshop for Glass reference books. 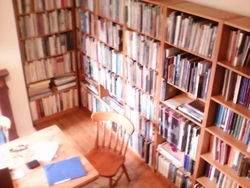 The bookshop is open 11 to 5 Monday to Saturday. However visitors from abroad should ring to check first. The Saint Bookstore specialises in hard to find titles & also offers delivery worldwide for reasonable rates.